The Silky Saw and Felco are the BEST Pruning Tools on the Market! Don't forget to look at our Hand Tools and Wheeled Tools! Silky saws are manufactured in Ono, Japan, home of the finest cutlery steel known to man. Crafting fine wood cutting saws since the early 1900’s, Silky continues to raise the bar for quality, endurance and cutting efficiency that none can match. Silky saws feature rust-resistant, hard chrome-plated blades with an impulse-hardened non-set tooth design. The precision-ground, razor-sharp teeth provide fast, clean and smooth cutting. POCKET BOY is available in two blade lengths: 5-inch (130 mm) and 6-3/4-inch (170 mm). Both blade lengths are available in three teeth sizes/configurations (tpi - teeth per inch): 7 tpi - Large/Coarse (pruning, green wood), 8.5 tpi - Medium (soft wood), and 17 tpi - Fine (hard wood, bamboo). Compact lightweight folding saw will take up very little room in your pocket or backpack. Nicknamed as Little Giant due to its extraordinary cutting capacity, this saw has exceptional design, strength, balance and superior finish quality. Clear plastic flip-lock carrying case with belt clip is included. An ideal saw for your glove box or to carry on hikes. F180 is available in two teeth sizes/configurations (tpi - teeth per inch): 6.5 tpi - Large/Coarse (pruning, green wood) and 12 tpi - Fine (hard dry wood). Lightweight strong folding saw with 7-inch blade suitable for multiple tasks. Put this handy, lightweight tool in your pocket, glove compartment or tool box. It is an ideal cost-effective all-round folding saw that is always ready for all pruning tasks and outdoor projects. Silky’s large, multi-purpose BIGBOY saw is every outdoor worker’s dream. With its 14.2-inch blade and rubber-cushioned, double-fist handle, you’ll have all the cutting power you need waiting right in your back pocket. Suitable for cutting green or dried wood. ZUBAT is the best-selling, professional, heavy-duty hand saw with an 11-4/5-inch, curved, mono-constructed blade. Curved blade provides greater cutting speed with less effort. Suitable for all pruning tasks and cutting large branches. GOMTARO is a beautifully balanced straight pruning saw with a 10-2/3-inch, ultra-strong, mono-constructed blade. Great combination of high performance blade with an integrated non-slip cushioned comfort rubber handle that really sticks in your hands. Durable black polypropylene sheath with belt clip is included. Ideal for all pruning tasks. TOPGUN is available in a 9-1/2-inch (240 mm) blade length. 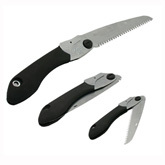 Lightweight, all-purpose folding saw with a 9-1/2-inch blade and superb cutting ability. The bright-yellow steel-reinforced handle and reliable spring-loaded blade lock make sawing safe and comfortable. It makes a great gift and ideal for pruning as well as cutting dry, hard wood. HAYAUCHI is the pole saw of choice by professionals. The aluminum alloy extension poles are oval shaped, providing precise control over the direction of the blade (especially important for high cutting) and giving strength and rigidity to the pole thus reducing bending to the minimum. The base pole has a pole-end shock absorber and comfortable rubberized overgrip which ensures good hold and control. The 15-2/5-inch curved blade utilizes proprietary Silky 4-RETSUME (Four Rows of Teeth) Technology. Ideal for the toughest pruning jobs! Blade can be adjusted to two different angles for lower or higher cutting and features an upper and lower sickle. The upper sickle is used to cut vines and the lower sickle to undercut bark. Lower sickle provides a clean cut without damaging tree, while upper sickle prevents blade from slipping off limb. HAYAUCHI is the finest telescoping pole saw available on the market today. The original Felco pruner. The most recommended bypass pruners in the world! Loaded with everything that makes a Felco pruner so great. The strong, solid-forged aluminum-alloy handles have easy-to-grip covers and are nearly unbreakable. The Swiss precision-made, hardened, replaceable cutting blade is as sharp as a scalpel. The anvil blade with a sap groove never needs sharpening and should last a lifetime. A rubber cushion and shock absorber provide smooth working and soft closing to spare your hands and wrists. Includes adjustment key. Packaged in attractive plastic package suitable for storage, with instructions for care and maintenance tips. Length 8 1/2 inches, Weight 8.5 ounces. Recommended cutting capacity is 1.0 inches. Designed for those with smaller hands who may prefer a smaller, lighter pruner. This is one incredibly well-made bypass pruner. If you're looking for the Felco quality we love so much, but the Felco 2 or Felco 8 are just too big for you, get the Felco 6. It's comfortable to use yet every bit as sturdy and powerful as any other of the Felco pruners. This great tool is ideal for small pruning work such as grape vines, shrubs and young trees, it is also the first choice of many florists. The anvil blade is screw-mounted for easy replacement. The shorter blades facilitate closer cutting to the stem of the plant. Length 7 1/4 inches, Weight 7.5 ounces. Recommended cutting capacity is 0.8 inches. © 2013 JRK SEED. ALL RIGHTS RESERVED.